I blink at the head on the wall. “He’s the most photographed bull in Seville,” she explains, slashing flesh beneath her knife. If a matador performs well, he slices off the bull’s ear as a trophy for his beloved. This is the sort of thing I didn’t know before. It’s Saturday morning and I’m wandering through the shadows of Triana’s covered market, close to the ruins of the Spanish Inquisition. Seville has a reputation for passion, for flamenco, and the blood and dust of the bullring. Triana, on the “wrong” side of the river, is its wild and wayward cousin. 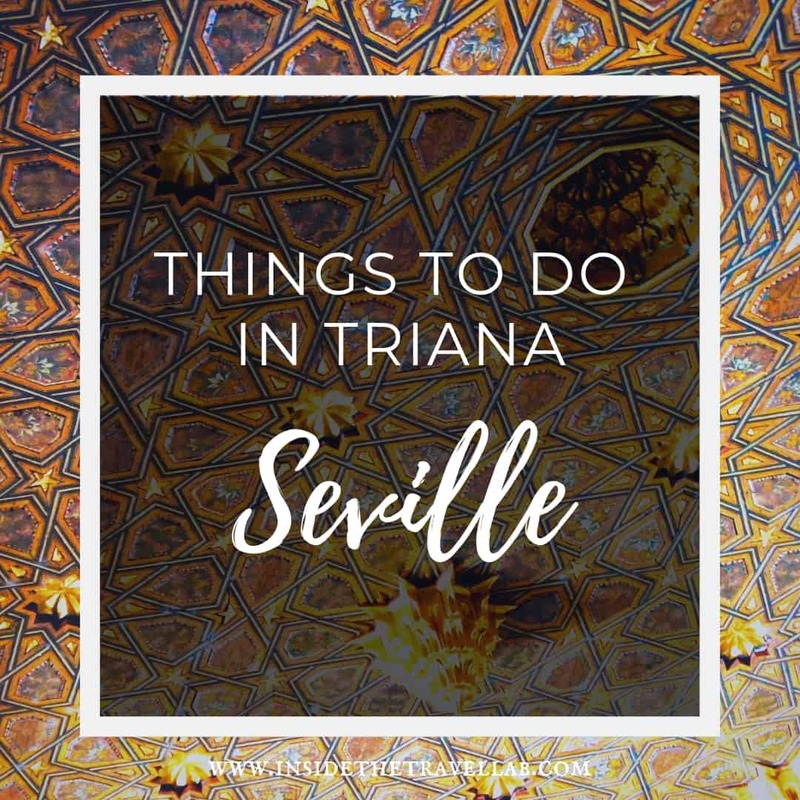 Triana prides itself on partying the hardest – and in a city that starts dinner at ten and hits the streets at midnight, that’s saying something. It prides itself on its ceramics and on its controversial place in history (the sailors alongside a certain Christopher Columbus all came from this part of Spain.) It even tries to claim both the music and dance of flamenco as its own. Yet Triana doesn’t feel like a place that lives in the past. More that it’s so alive, it hoists its history along on its shoulders. On almost any given Sunday, to the scent of incense and the sound of a sorrowful band, floats wobble through the streets, bearing life-sized figures of Christ balanced on Triana’s strongest men. It’s a fascinating sight, with men, women and children decked in gold-trim costumes, cardigans and velvet breeches, while constantly chatting into mobile phones. Despite the chaos, Triana still has a few streets that offer a moment of calm: Calle Pelay Correa, Calle Torrijos and Calle de la Pureza. Whitewashed, with a mustard-yellow trim and lines of soft-scented orange trees, they’re like the famed streets of the Santa Cruz Quarter – only without the tourists. One of the things I love the most about Andalucia is the attention to detail: even the underside of balconies are decorated with glazed azulejos tiles. 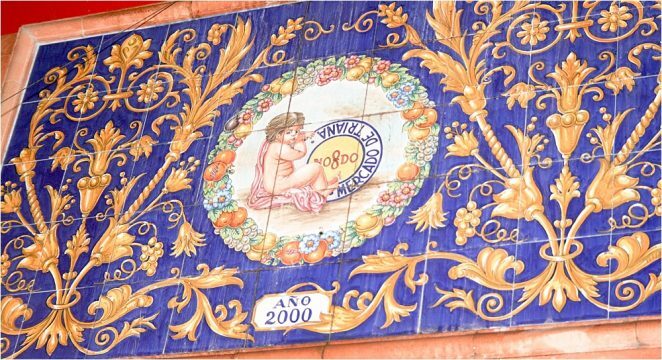 Painted in canary yellow, olive green and a decadent blue, these tiles from Triana’s workshops have spread across Seville, Spain, and the world. Back in the market, there’s no room for the squeamish. 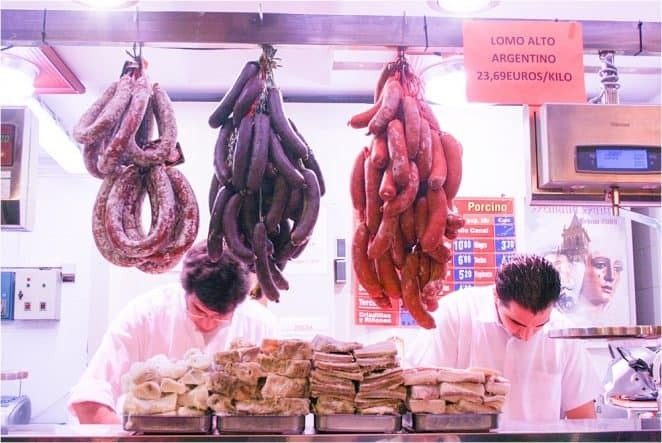 Tongues sit stacked together and whole legs of cured jamon hang by their hoofs from the ceiling. Fish mouths gape open as a matriarch guts and fillets the rest with the slickness of a magician with a deck of cards. I hurry past, to the frutas y verduras counter that brims with pomegranates, apples, pimientos and plenty of cartoon-shaped squashes. Wherever you are in Triana, you have to shout to be heard, be it in markets, bars, streets or religious processions. Nowhere is safe from the chopped and diced fragments of conversation. By now, I’m at the edge of the Puente de Isabel II, opposite the entrance to Triana’s covered market and the curious Capillita del Carmen chapel. With my blonde hair and pale skin, I’ll never blend in here, but I can learn the language and ease into the culture. I order a crisp, cool cerveza and gaze across the river, taking in the Torre del Oro and La Giralda, Seville’s most well-known landmark. That’s another thing about Triana; it really does have the best view. Hi, Seville, Granada, Malaga, Cordoba all so beautiful and diverse but have you been to Jaen? Not so much written about my local city. What a word-rich, descriptive post! I always love hearing other’s perspectives and experiences in Spain. You’ve inspired a return trip to Sevilla for me! I love Sevilla…but it sometimes is too touristy. Last time I was there (about2 years ago) I almost only heard english on the streets of the city center! Triana is rather local, which is why I really like it. Hi Rachel. I’ve only driven through Jaen (twice!) en route to somewhere else. It’s a shame, though, as the centre with its fountains and atmospheric streets looked beautiful. Another place on the list for me! loved your description. 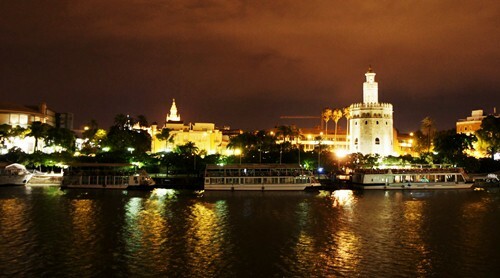 At present I live here in Seville too and now even I want to go to Triana again to bring these words to life. Sounds too as if Jaen is yet another place to visit. Back in Sevilla for another taste of the city! I’m headed to Seville in May and am drooling over all of your photos and experiences! I’ll be in the city for 2.5 weeks, mostly serving with community organizations that work with the homeless. Any places you can recommend that I absolutely have to visit while I’m there? I’m always looking for a hole in the wall to eat or somewher off the beaten path to explore. I’m totally late to the party here, but this article came up when I searched Triana and I have to say, it’s beautifully written. I can’t wait to experience it tomorrow :)! There’s no such thing as late to a party! Especially not in Seville ;-) Thanks for the kind words and have fun tomorrow!